All “Mekk-Knight” monsters on the field gain 300 ATK/DEF. Once per turn: You can discard 1 “Mekk-Knight” monster or 1 “World Legacy” card; draw 1 card. You can banish 8 “Mekk-Knight” monsters with different names from your GY and/or face-up from your field; send your opponent’s entire hand and Extra Deck to the GY. World Legacy Scars is one of those Field Spell Cards that doesn’t really need Terraforming. It pumps all Mekk-Knights by 300 Atk and 300 Def which is nice. 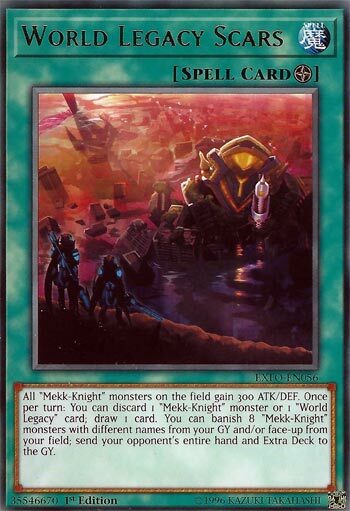 You can discard a Mekk-Knight or a World Legacy card to draw 1 card once per turn. That’s a better effect, particularly if you draw multiple of this in your opening hand. The last effect is largely impossible. You can banish 8 Mekk-Knights from the grave or your field if they were face up to force your opponent to banish all their Extra Deck and Hand cards. All 8 Mekk-Knights need to have different names. A brutal effect to be sure, but the requirements are unrealistic most of the time. As I mentioned before, Terraforming is not really needed here because the effects are just good. If you draw into Terraforming, that would be hilarious to me. 2 good effects and a rare effect make for an average card. There is potential depending on any Mekk-Knight or World Legacy grave effects that may come in the future. We will move on from the monsters and look at the Field Spell for the Mekk-Knights, World Legacy Scars. While Scars is on the field, all Mekk-Knights gain 300 ATK and DEF. Any stat boost isn’t necessary on a Field Spell anymore, but it is nice to have. Once per turn, you can discard a Mekk-Knight or World Legacy card to draw 1 card. Mekk-Knights have a Call of the Haunted, so you can use this to discard a Mekk-Knight you don’t want to summon at the moment to get some draw power. You can also ditch a World Legacy card you don’t need that you might have because you already control another one to get a draw into something you don’t have yet. Draw power is always great. Finally, if you manage to get 8 Mekk-Knights with different names in the GY or face-up on the field, you can banish them to send the hand and Extra Deck to the GY. If you pull this off while maintaining some field advantage, you should win the game since your opponent will no longer have hand resources or their Extra Deck to use, but you likely will not be using this effect. Overall, this isn’t a terrible Field Spell for the Mekk-Knights. Worth having a few of to get some draw power. Art: 5/5 I love the lore of the World Legacy. Is it just me, or is this not a Throwback? World Legacy Scars (which obviously isn’t a Throwback) fits the theme very well, as you would hope to expect from a Field Magic card. 300 extra attack and defense for all Mekk-Knights, fun enough effect. A boost is nice, and it’s not anything to make them towering or broken, so I support it. It has a Draw bonus, where you can trade the discard of a Mekk-Knight or a World Legacy card and Draw a card instead from your Deck, which is an awesome benefit. Lastly, you can remove eight Mekk-Knight Monsters from your Graveyard and/or from your side of the Field (face-up) to send all cards (ALL cards) in your opponent’s Hand, and their Extra Deck to the Graveyard. Zounds…that’s one hell of an effect. That effect, however, is impractical, good as it may look in print. I feel if you get to the point you can pull that off, you’re probably about to lose anyway, but maybe not. But, too, being able to get that effect off, should be able to get you a win. Ironic, no?